Supporters of the All Progressives Congress in Osun State on Wednesday trooped out to celebrate the victory of the party’s candidate, Maj. Gen. Muhammadu Buhari (retd) in Saturday’s poll. 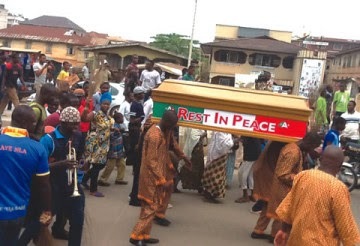 Some of the APC supporters were sighted at Gbogan/Osogbo Road carrying a casket draped in Peoples Democratic Party’s colour and logo. The supporters, accompanied by trumpeters, danced through Odi Olowo Street and some other streets in the Osun State capital, rendering victory songs and mocking the PDP, whose candidate, President Goodluck Jonatha, lost to Buhari. An APC member of the House of Representatives from Osogbo/Olorunda/ Irepodun/Orolu Federal Constituency, Mr. Lasun Yusuf, described the action of his party’s supporters as abominable. Yusuf, who is the Deputy Chairman of the House Committee on Water Resources, said the supporters’ mode of celebration was not acceptable to the party. “That is over zealousness on the part of people you cannot control. It is bad and should be not be encouraged by anybody. It is abominable but you should know that these are the people you cannot control,” he said. Yusuf lamented the defeat of two members of the House of Representatives from the state by the PDP, saying it would affect the joint projects being undertaken by all the National Assembly members from the state.